Please bring your own subject matter and battery-powered light. 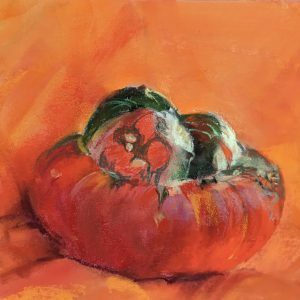 Bring fruit, vegetables, or flowers and your sense of adventure to Lost Pines Art Center on Monday, August 5 for a three-hour workshop using PanPastels® to block in local color and values for a simple still life or floral painting. All materials will be provided, but you may want to bring a portable easel if you have one, along with a few pastel sticks and/or pastel pencils. The class will be informal, supportive, and friendly, and all supplies are provided. 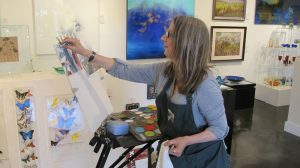 Denver native Enid Wood has a degree in art education from Westminster College, where she studied portrait, figure, and still life painting in pastel and oils with Don Doxey. Later, she studied art history at Yale as part of an interdisciplinary masters degree program. Painting is her second career, after more than 30 years as a violin teacher in Britain and the USA. She has studied pastel landscape painting with Albert Handell. Enid’s colorful paintings appear in numerous national and international exhibitions, and have been awarded a multitude of prizes. She enjoys brisk sales in several Texas galleries. Her paintings hang in corporate and private collections worldwide. Enid has been elected to signature status in the Pastel Society of America and the Pastel Society of New Mexico, and is an Associate with Distinction in American Women Artists. She is a frequent contributor to Pastel Journal, and paints both in her Bastrop studio and outdoors.